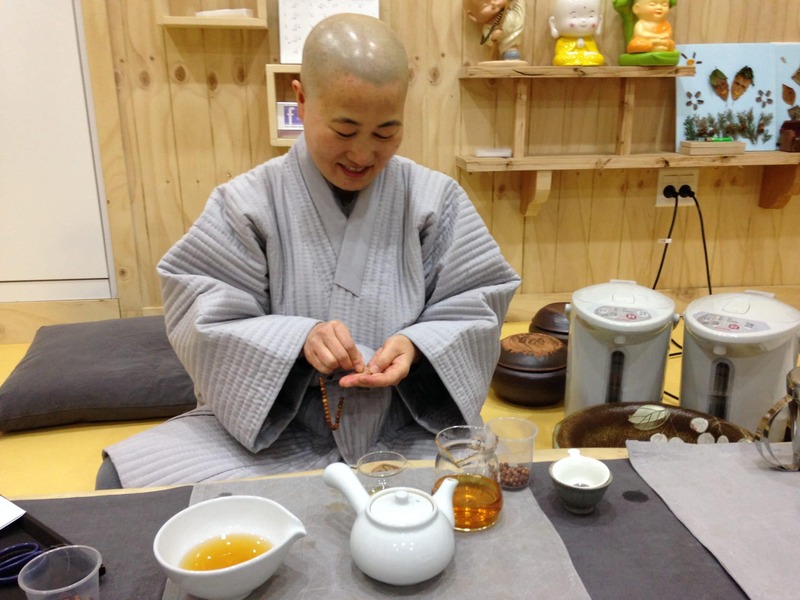 On the morning of 8th of February 2015, I moved with my new guide and trusty translator Eunsi Cho to the mountainous region of Gurye via Suncheon, in order to stay at a Buddhist monastery. I would say that it was here that I experienced the high point as well as the low point in my visit to Korea. The beauty of this traditional, working monastery with its truly exquisite buildings and sculptures made of wood will be etched in my memory for always. I had to submit myself to a very strict regime for 24 hours, starting with a lesson in temple manners and the use of the temple uniform that I had to wear over my black suit. I was taught the correct etiquette to greet a monk and how to conduct myself during mealtimes when all conversation was forbidden. I was given a bare monastic cell with no furniture (but fortunately with underfloor heating), so that I could have an experience of extreme austerity. The wake-up call in the morning was at 3 am and at 3.30 am we had to proceed to the early morning ceremony in the Buddhist cathedral located on a higher slope of the mountain. The temperature was minus 10 degrees centigrade! I was definitely not prepared for this in terms of clothing, and unsurprisingly I began to get quite ill. My extreme discomfort was tempered by the sheer beauty of the surroundings. On the way to the cathedral we passed the gigantic, open-air drum which was being ritually sounded in a vigorous rhythm by a monk with two wooden beaters. The robust rhythm of this gigantic instrument resonating in the clear early morning air of the mountain is one of my most cherished musical memories ever. We then proceeded to the cathedral itself, climbing up a steep bank of steps to enter through its tall and gigantic doors. Inside was a sacred interior unlike anything I have ever seen before. I can truly say that it was the most remarkable religious space I have ever encountered in my life. There were several monks assembled there in meditation and fortunately since I am trained in vipassana (mindfulness) meditation I was able to experience this place as a meditative space, watched over by the most stupendous sculptural representations of the Buddha and his principle disciples. The meditation also involved a certain amount of ritualistic chanting and 108 prostrations, to which we were invited to participate voluntarily. It remained extremely cold throughout and my discomfort was very extreme too, and yet the space itself was so luminous, peaceful and colour-filled. I would love to visit this monastery again someday in warmer weather, and better prepared with more protective clothing. After this we retreated back into our monastic cells and prepared for early morning breakfast at 6 am. All meals were eaten in silence (as did the historical Shakyamuni Buddha himself) and this was a unique experience, free of dining table chatter. After breakfast I was given the privilege of an hour-long audience with a Buddhist nun, who invited my guide and me to a tea ceremony and presented us with specially strung wooden-bead bracelets she made for us. 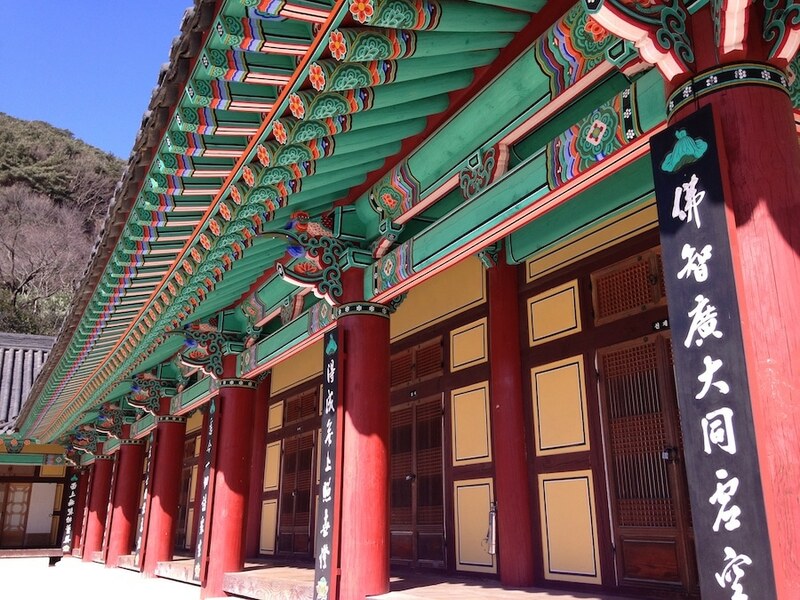 By this time I had begun to feel increasingly ill, and the cold was unbearable, so I asked my guide Eunsi Cho from KMP to forego some scheduled sight-seeing in the Gurye area and proceed immediately to the next city of Namwon, where I could rest in a heated hotel. Eunsi Cho bundled me into a taxi and whisked me to a traditional Korean pharmacy where I was able to purchase a range of Korean medicines and palliatives to ease my cough and fever. Naturally I was anxious to get well as soon as possible so as not to jeopardise the rest of my visit. We ended that evening with Eunsi Cho thoughtfully selecting a restaurant where they served us a large pot of hot chicken broth. The herbal medicines and the soup worked wonders and I began to improve rapidly.